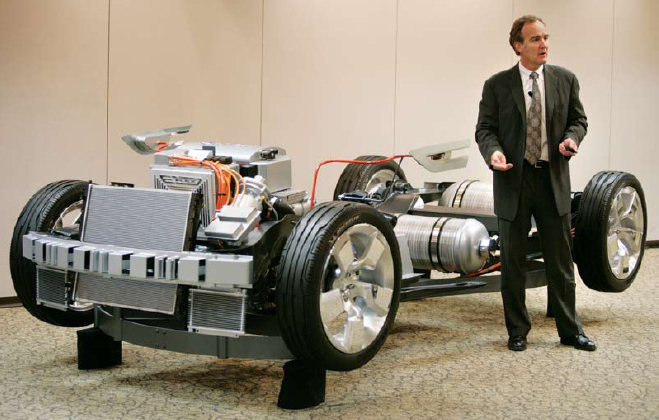 Lawrence D. Burns, GM vice president, research & development and strategic planning with Volt. Soft hums and gentle whirs fill the small studio hidden deep within the General Motors Technical Center, in the Detroit suburb of Warren. In one corner, designers and engineers keep their heads bowed low over their CAD/CAM screens, their labors transformed, at the other end of the building, by a set of automated milling machines carving new forms out of lumps of soft clay. What emerges could shape the future of the entire company. 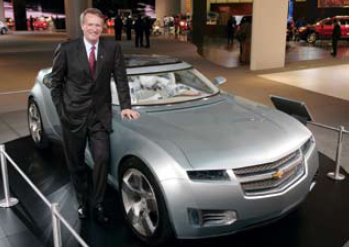 “We know we have a perception problem, at GM,” admits design executive Bob Boniface. Where environmentally-conscious consumers look at Toyota and see “Prius,” they look at GM and see “Hummer,” and that’s “something we have to fix.” admits the former Chrysler stylist who now oversees design of the Chevrolet Volt. First shown at the 2007 Detroit Auto Show, Volt quickly captured the imagination of motorists around the world, never mind environmentalists, regulators – and competitors, like Toyota. Unlike the Japanese automaker’s hybrid-electric sedan which primarily relies on its gasoline engine backed up by an electric drive system, Volt is a so-called plug-in hybrid. In production form, it will feature an oversized battery pack capable of running the vehicle for up to 40 miles – enough for most daily commutes – solely on electric power. But on longer trips, a small, internal combustion engine will kick in, providing Volt with the added range lacking in traditional electric vehicles. If GM can hold to an admittedly aggressive schedule, and deliver the first Volt to dealers by 2010, it could gain the critical first-mover advantage over its rivals, notably Toyota. And with its big Hummer brand likely to be sold or shuttered, the Detroit maker could paint a green aura around itself at a time when it desperately needs, once again, to be seen as a leader, rather than a follower, a position the giant manufacturer isn’t used to being in. For the better part of the last century, General Motors dominated the global auto industry. But in recent years, it has been casting a nervous glance over its corporate shoulder – especially in the home, U.S. market. Now, with the sudden run-up in fuel prices, there has been a sea change shift, with American motorists by the millions, switching from the big trucks that have long dominated GM’s line-up to the small cars and “green machines,” like Prius, that have made Toyota such a daunting competitor. The two makers wrapped up 2007 in a global dead-heat, GM maintaining its position as industry king-of-the-hill by just 3,100 units. But if first-half figures hold for the rest of this year, the American maker is about to tumble off its throne. Through the end of June, Toyota held a worldwide global sales lead of about a quarter-million vehicles, and few see GM regaining its momentum anytime soon. The automaker is drastically slashing production capacity in the U.S., shuttering or slashing production at its light truck plants, and eliminating tens of thousands of jobs. The latest cuts were announced in July when CEO Rick Wagoner revealed plans to speed up production cuts, trim another 1,800 white-collar jobs and, overall, slash about $10 billion in costs, while raising another $5 billion to keep the vast empire funded. Only a few days later, GM delivered still more bleak news: a $15.5 billion loss for the April-June period, the third-largest quarterly loss in GM history. Wagoner continues to insist that there is “no thought… whatsoever” of bankruptcy, but frustrated analysts and nervous investors alike keep wondering just how much longer things can continue. It’s a heck of a way to celebrate the carmaker’s 100th anniversary. GM has dodged many bullets. In 2000, the new CEO, John Smith, was forced to unwind what Roger Smith (no relation), who died earlier this year, had put in place. Plants were rebuilt, even replaced. Products went through massive updates. And Jack Smith outlined a series of sharp cuts in manpower and production capacity. He also, belatedly, recognized one of the most significant shifts in American automotive history, committing billions, and the bulk of GM’s product development resources, to ramp up production of vans, SUVs and pickups. While light trucks might have been the products environmentalists hated, consumers loved them, snapping up as many as GM could build, and finally frustrating the Japanese, who struggled to crack the code in segments they’d never entered before. Even Toyota seemed perplexed by minivans, pickups and SUVs, rolling out a series of costly failures. But as GM had demonstrated before, success is a powerful narcotic, making it far too easy to ignore impending problems. Like the latest oil shock. Over the years, observers have often speculated about what would trigger the collapse of the light truck market. The answer was $4.00 gasoline. Four dollar gas would be a serious enough problem without what GM’s current CEO, Rick Wagoner, likes to call “negative headwinds,” which lately are blowing at hurricane force. Start with the American economic downturn; add stiffening foreign competition; then mix in sharp increases in the cost of raw materials such as steel for body panels, and rubber for tires. It adds up to thousands of dollars in added production costs, but in the current market, automakers can pass only a fraction of that onto consumers at a time when the U.S. market has plunged to its lowest level since 1992. In July, GM posted another double-digit decline, while sales overall dipped to an annualized rate of barely 13 million vehicles – down from more than 17 million earlier in the decade. 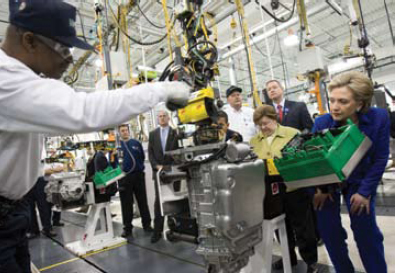 Hilary Clinton takes a tour of production at GM. Photo courtesy of GM. Only a few years ago, employees at the GM Renaissance Center proudly wandered the halls wearing “29” buttons, a reference to the market share the automaker was aiming for. That was a far cry from the numbers former GM President MacDonald scoffed at, but the figure looks awfully nice at a time when the automaker could soon slip to 20 percent – or less. during a downturn, Stempel concedes the current situation is dire. getting leaner by the day. And it is an increasingly global entity. A decade ago, Jack Smith had to stand up against a cadre of naysayers, investing heavily to launch the Buick brand in China. Today, that’s the automaker’s fastestgrowing market, while once-risky ventures in emerging markets like India and Russia are also helping offset troubles in the U.S. and Europe. The percentage of GM’s unit sales rung up overseas has risen, in just a couple decades, from 25 percent to 50, and Vice Chairman Bob Lutz, who has spent much of his own, long career abroad expects it to reach 75 percent in the coming years. But for now, GM’s fate continues to hinge on the American market, where many of its once-prized products are now sitting, unloved and unwanted, on dealer lots. The first challenge is to come up with the products that the market is demanding, says independent auto analyst Dan Gorrell. The tougher task will be to get American consumers to put GM back on their shopping list, whatever it produces. In trend-setting markets, such as California, he cautions, that won’t be easy. The shift has begun, GM sales and marketing chief Mark LaNeve pointed out that 11 of the carmaker’s last 13 launches were either cars or crossovers. And the executive noted that a number of the newest products are showing positive signs in the marketplace. But it’s critical to note that passenger cars have typically delivered a fraction of the profits of a truck. Indeed, for decades, GM has struggled to minimize the money it loses on every sedan and coupe it sells in the U.S.
Of course, it didn’t help that GM would often develop unique products for each of its key markets. Lutz has ordered a global consolidation of product development, readily apparent at the Saturn division, which is working in tandem with the European Opel subsidiary on products like the new Astra subcompact. There will still be regional differences, from sheet metal styling to the level of standard equipment. Considering a major new product can cost a $1 billion to bring to market, however, the savings are enormous. 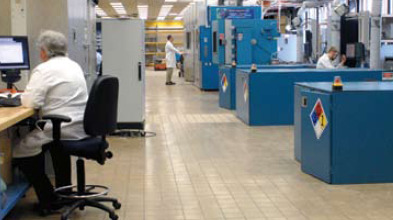 GM’s battery testing center in Warren, MI. Photo courtesy of GM. Meanwhile, a new focus on quality shows GM steadily climbing up the quality charts, as well. The new Chevrolet Malibu ranked high in the latest J.D. Power Initial Quality Survey – and was named North American Car of the Year, by a panel of 50 U.S. and Canadian autowriters. But the best payback of all, GM can’t build enough to meet current demand. GM, however, needs more Malibus and fewer Hummers. And it needs them fast, if it hopes to ensure that this won’t be its last anniversary. That’s why the Volt is so important. In terms of raw numbers, the plug-in hybrid won’t reverse GM’s sales decline, but it could give consumers a more favorable impression of the ailing automaker, just as it begins the switch back from trucks to cars. If it can’t regain that confidence, no matter how much it saves, no matter how more capital it raises, GM’s future will be bleak. 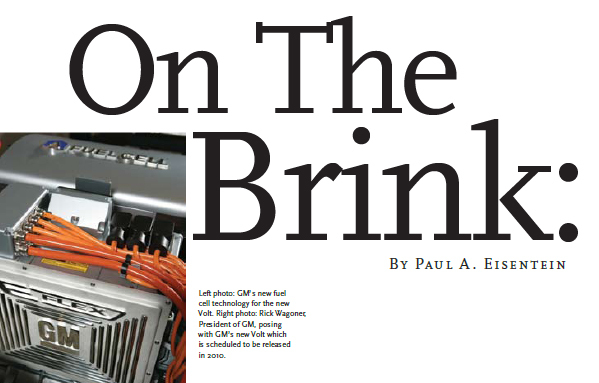 TMW: In the Atlantic Monthly about 2 months ago the price of the Volt was quoted at $35,000. In a recent interview with Phil Lebeau on CNBC the price was quoted at $45,000. How much will the Volt cost? PE: I have heard numbers all over the place for what Volt will come in at. I am not convinced either of those numbers is correct, as Troy Clarke, president of GM North America, specifically told me, in a conversation several months back, GM expects to financially subsidize the first-generation Volt, much the same way Toyota swallowed at least $10,000 of the cost of building the Prius, for quite a few years. I wouldn’t be surprised to see the lower number, perhaps something even lower. Perhaps GM has changed strategy since I spoke with Clarke, which is quite possible. TMW: Will the Volt really come out in 2010? If two kids can put a lithium ion battery in their parent’s Prius (story from a recent interview in TMW) and get over 100 mpg, why can’t a giant like GM do it? What are the difficulties they face? PE: I am so fed up with talk about what “kids” with aftermarket tech do. Let’s look at what a well-funded venture, like Tesla is still struggling to accomplish, and in their case, they’re forced to use more than 8,000 laptop computer-style batteries. They’ve only produced a few vehicles, and have changed key suppliers—primarily for the dysfunctional transmission—repeatedly. When Toyota can pull it off, not these kids, then we can talk. Okay, so Toyota is trying, and I’ve driven THEIR prototype. They’re using a more conventional parallel hybrid approach. And, Toyota, for now, says it will only get a minor fraction of the battery-only range of Volt. Oh, and look for a big price tag there, too. I have heard plenty of rumors that Volt is struggling to make 2010. Frankly, if they got a few out, late in the year, and had a hard date, in 2011, for retail, they’d be forgiven — again, if it’s a successful design. Not trying to defend GM, by the way, but go apples-apples. Okay, the difficulties: batteries are by far the real challenge. But as I am now seeing other makers, like Nissan, say they’re confident of their improved battery capabilities, I think GM may also be improving. FYI, Nissan’s pure EV will reach U.S. fleet buyers in 2010, with a promised 100 mile range. TMW: Why is the GM quality touted as so wonderful in China and considered generally poor here? What are they doing differently in each country? PE: For one thing, Chinese suppliers, ahem, are bad. So any automaker who can achieve quality levels there, equivalent to bottom of-pack (according to JD Power) here, is a star. GM has some of the most modern and efficient plants in China. This was a critical decision approved by Jack Smith, a decade ago. Many makers entered China with old-strategy plants; using lots of very cheap manpower and building old cars (market leader VW), dismissing the quality issue. Smith approved a relatively high-tech plant that was modeled after GM’s world-class Eisnach facility, in Germany. Initially, it was also low tech, in terms of raw manpower, but used much more state-of-art management systems to boost quality. As production has grown, and as labor costs have risen, the Buick facility, in Shanghai (S-GM), has steadily added more robotics and automation. TMW: What’s with GM’s president, Wagoner? If any other company’s stock had fallen 75 percent in the last 2 years, the CEO would have been fired. Why do you think he still has his job? Could an outsider run GM? PE: Everyone asks this question. Myself included. This is the subject of a very long conversation. He continues to have the support of the board. Indeed, the GM board has apparently given Wagoner another vote of support. To be honest, I don’t think an outsider would be able to tame GM in the way Mullaly is trying, at Ford. But I still don’t understand why he remains on the job. TMW: What brand besides Hummer would GM be most likely to sell? What other brand is valued highly enough that it could be sold if need be? PE: There have been reports (from myself, included) that GM is reconsidering the viability of ALL its brands. GM denies it, but I believe there’s a serious, internal discussion. Only Chevy and Cadillac are untouchable, and rightly so. Pontiac is a shell of itself, and Buick would be dead, but for its success in China. Ed Welburn, global design director, told me in April, that without China, Buick likely would have to go, but it’d be difficult to kill the brand in the States and not send a very bad message to Chinese buyers. Note the automaker has begun turning to its Chinese product development unit, PATEC, to lead creation of future Buicks. GMC is a clone of Chevy truck, and could go, what with its market collapsing, but with that name, who’d buy it. TRIVIA QUESTION: do you know what GMC stands for??? Saturn, well, they’re investing a lot in it, making it the most European of GM’s North American brands. If vehicles like Astra fail, there’ll be serious questions asked. TMW: Why did GM really cut the EV1 electric car? reverse that… not until now, when the new technology, ie Lithionm Ion batteries, has makers rethinking the EV’s potential. The bad news comes across with stunning regularity: record losses, double-digit sales declines, plant closings, job cuts. It’s hard to read a headline out of Detroit that doesn’t deliver another body blow to Big Three. It wasn’t supposed to be that way. Preparing for its 100th anniversary, as the year began, General Motors was forecasting a much-anticipated turnaround. Ford was hoping to gain traction of its own, with its oft-revised “Way Forward” program. And Chrysler was hoping to settle into a groove after its divorce from German partner Daimler AG and its acquisition by the huge private equity fund, Cerberus Capital Management. Then things got rough. Commodity prices, for everything from steel to rubber to the platinum for catalytic converters, shot skyward. But the biggest price increase was for gasoline, which soared past a record $4 a gallon, suddenly triggering what Jim Farley, Ford’s director of sales and marketing, described as a “sea change” in the American automotive market. When gas prices started nudging the $4 mark, demand collapsed. As the year began, full-size pickups accounted for a full 12 percent of the American market. By mid-year, that was down to barely eight percent. In July, domestic light trucks sales were off by nearly a third, and the Big Three couldn’t cut back production fast enough. Of course Gm is not alone. The Asian companies are rapidly shifting to small cars – like the Honda Fit – and an array of hybrids and other “green machines,” leaving Detroit to play catch-up. Ford plans a major “Europeanization” of its American product line-up, starting with the launch of the Fiesta subcompact, in 2010. But under current market conditions, that’s a long wait, and many analysts wonder whether it can hold out, especially in light of its record, $8 billion second-quarter loss. As part of the privately-held Cerberus, Chrysler releases only minimal financial data. CEO Bob Nardelli insists the automaker has been able to bank a billion since the year began, but most analysts see Chrysler in the worst condition of the Big Three. Without Daimler, it is all but totally dependent on the U.S. market, and doesn’t have European design operations to turn to. So, the American maker is racing to partner with the likes of Nissan – which will supply it with a version of the small Versa – and several Chinese makers. If any automaker has gone to the brink before, it’s Chrysler, which has an uncanny knack of getting in deep about once a decade. So far, it’s found a way to improve its fortunes every time. But the current crisis may be more than it’s bargained for, and the situation isn’t much better for Ford or GM, either.